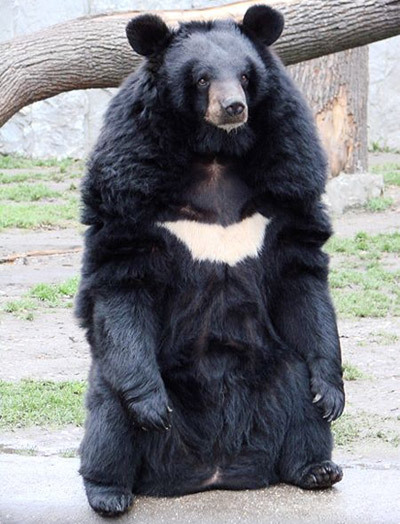 They are also known as Moon Bear or by their scientific name Ursus Thibetanus. These bears are from Ursidae family. These bears are similar like American black bears. 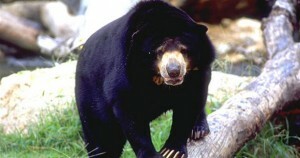 Asian black bears are arboreal (lives in trees) animals. They have incredible ability to balance on with their hind feet and this is skill can be useful for them in many ways. Human sometimes train these Asian Black Bears to perform these balancing tricks. Lifespan of the Asian Black Bear is of around 25 years. Body length of Asian Black Bear is about 4-6 feet. These humongous bears occupy their home range of 10-20 square km. In most cases they are active at night. Gestation period of Asian Black Bear is about seven to eight months. Distribution: Korea, China, Russia, Afghanistan, Taiwan, India, Bhutan and many other places. Habitat: Forests, mountains, and hilly areas. Diet: Asian Black Bears are carnivorous animals who consume meat as well as plants. This bear consume birds, mammals, fish and mollusca. Throughout the year ‘Khao Kheow Open Zoo’ offers spectacular varieties of Asian Black Bear. This heart-warming journey to the jungle adds fun, thrill and excitement in visitor’s trip. It enables wild enthusiast to understand wildlife’s mesmerizing beauty in the easiest way.